Placed below is an article published in Jan2013. Kathmandu is one of the most vulnerable cities in the world, also experienced rapid urban development .. The population has increased from 427,045 in 1991 to 671,805 in 2001 and is projected to touch a figure of 915,071 in 2011 and 975,453 in 2012 ..
Construction of buildings considered too weak to withstand a powerful quake, similar to Haiti catastrophic earthquake of M 7.0 what kill more of 316,000 people .. 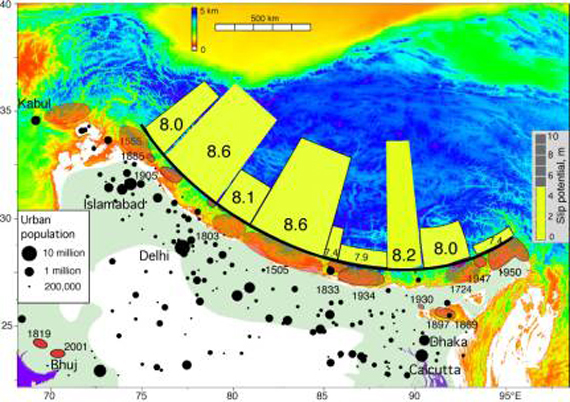 Images of the Main Himalayan Thrust (MHT) fault showed that a segment of it dips downwards by 15 degrees, and is steeper and further north than suggested by previous observations. This dip could rupture and cause an earthquake of magnitude 8 or more, often referred to as a mega earthquake. The researchers predict that the segment will break over a larger area of the fault and create a larger magnitude earthquake than previously thought. "The larger the area of the fault that breaks, the more energy is released, and the larger the magnitude of the earthquake,"
The study, presented at the American Geophysical Union Fall Meeting in San Francisco earlier this month (7 December), measured ground movements. 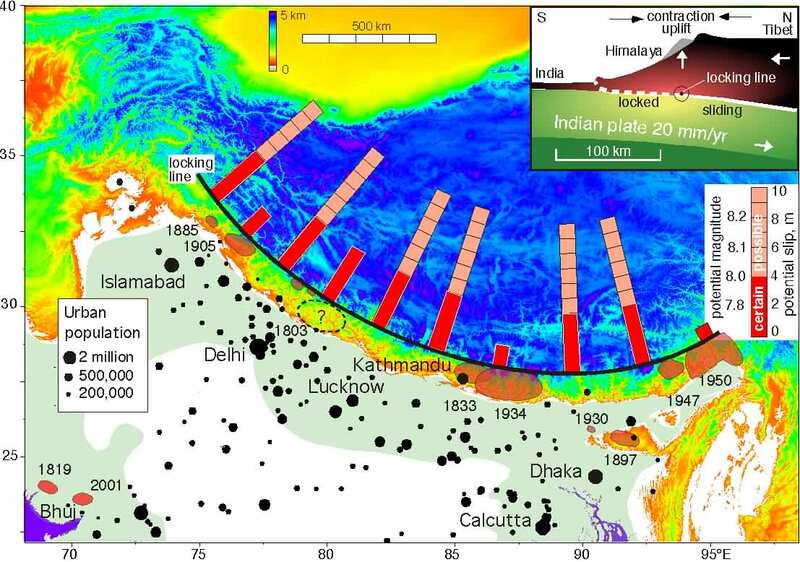 By placing seismometers closer together in one area, the researchers have been able to produce a more detailed image of the MHT. Klemperer says a big earthquake would start at the top of the sloping segment. "This is in central Nepal — where Kathmandu is — but such a big earthquake would devastate a much larger area." "This would cause huge landslides, some of which would dam rivers, and produce large lakes. There would be catastrophic floods," he says. "The main area of concern is in central and west Nepal, where there has not been a large earthquake for a long period," Petley told AFP after Sunday's 6.9-magnitude quake damaged hundreds of homes in the east of the country. "This is an earthquake-prone area, so this suggests that there is a large amount of energy stored," he said. Nepal is a highly seismic region, lying above the collision of the Indian and Eurasian plates that created the Himalayas, and major earthquakes have hit the Kathmandu Valley every 75 years on average over recent centuries. One quake destroyed a quarter of homes in Kathmandu 77 years ago, and geologists believe the area is at immediate risk of an 8.0-magnitude tremor - ten times the size of last year's Haiti quake which killed more than 225,000 people. "The building stock is not seismically strengthened, suggesting that in a big earthquake there will be large numbers of building collapses," said Petley, of the Institute of Hazard, Risk and Resilience at Britain's Durham University. GeoHazards International, a US-based research group, has measured the likely death toll from a quake of 6.0 magnitude or higher hitting cities in Asia and the Americas. Kathmandu topped the list of 21 cities with 69,000 potential deaths, ahead of Istanbul and New Delhi.